A: Being part of Hewlett Packard Enterprise Services, we are fortunate to work with customers across a wide variety of industries and use cases. As a result, our predictive models are pointed at numerous business outcomes. Some of the most common are predicting machine failure, application downtime, security breaches, financial risk, supply constraints, optimal pricing, next best offer, customer loyalty and many more. As most of our clients have made progress on their big data journey many are now focusing on gaining value from these investments. They are turning to analytics to help. This has led to the growth in predictive analytics over the past few years. A: Auto manufacturers face tremendous costs of recalls as a result of product failures. Not to mention the potential public safety risk. Early detection of part failures can save hundreds of millions of dollars. Recently, we worked with an auto manufacturer to develop predictive models that bring together product service events, manufacturing quality records and linguistic analysis of warranty service records to identify previously unknown and emerging part failures. Using predictive models allowed for identification if emerging issues much earlier than before. This enables the after sales manager to quickly identify potential issues, assess the risk and determine the proper course of action. In this case predictive analytics has been recognized as a critical technique for reducing overall cost and risk. A: On any given day there are over 150,000 active marketing leads at Hewlett Packard Inc. This represents everything from customers who register to download a whitepaper, register for a seminar, or contact our sales offices. HP Marketing has the task to sort, scrub, review, assess and decide how to handle each lead. Ultimately, deciding which leads to pass to Sales. This challenge was growing given the number of digital channels HP has to interact with customers and prospects. We worked with HP Marketing to develop a predictive model that leveraged multiple data sources to score each lead with the likelihood to buy, potential deal value, best offer and best response channel. The output of the predictive models were then fed into a decision management framework which automated the actions based on business defined rules and thresholds. This process led to an increased lift of 24% in conversion over the previous manual efforts which translated into a 30% increase in response conversion. HP Marketing was able to reduce the cost of this business process by 60%. More importantly, HP customers received quicker and more relevant responses. A: We recently analyzed 100s of sensors from a specially outfitted Volkswagen Touareg as part of the multi-day Cape-to-Cape world record race. We had all types of data, including temperature, pressure, telemetry, steering, braking and more. With no prior knowledge, we asked our data science team to run cluster analysis to see if they could identify how many drivers there were and when drivers switched, based only on sensor data. Our models predicted “3” drivers, profiled them based on optimal driving behavior and plotted the predicted driver on the route. The model worked extremely well. There were in fact 3 drivers; the route had a high match rate to the driver logs. One interesting result was that one driver seemed particularly different from the others. We later learned that there were actually two professional drivers and the cameraman took shifts for parts of the journey. It was surreal to see three world-record-holding drivers having a good laugh over a cluster scatterplot. A: The power of predictive analytics is undeniable. Especially now as data volumes are exploding, traditional business intelligence techniques are unable to keep up and find insights in this growing data. However, we are hearing over and over again from customers who have internal analysts building models, that there is chasm between developing a predictive model and putting that model to use across the organization. We call this Operationalizing Analytics. Based on our work with customers, we have identified 10 process areas that are important to crossing this chasm from developing predictive model to putting those models into action for scalable and sustainable business impact. 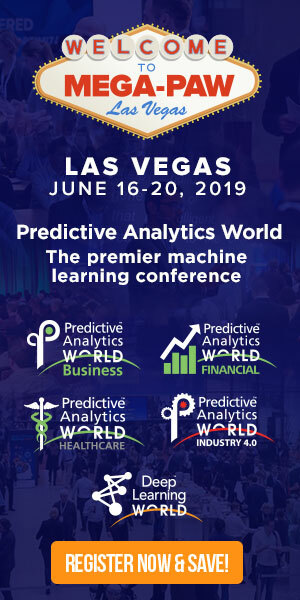 Don’t miss Ken’s conference presentation, Operationalizing Analytics: 10 Key Process Areas for Embedding Predictive Analytics into Business Operations, Applications and Machines, on Monday, April 4, 2016 from 3:05 to 3:25 pm, at Predictive Analytics World San Francisco. Click here to register to attend. USE CODE PATIMES16 for 15% off current prices (excludes workshops).